Over the last couple of years, we have told you about the Aakash tablet. This is a low priced slate available in India to students in the country for a ridiculously low price. Of course, ridiculously low price usually equals ridiculously low specs. Meanwhile, the Indian government is forging ahead with the fourth iteration of the tablet. The government wants to make a low cost tablet available to the students attending classes in the 25,000 colleges and 400 universities in the land. The proposed specs have been posted to the web sites of the Ministry of Human Resource Development (MHRD) and the Department of Electronics and Information Technology (DeitY) so that those involved in the production of the slab can comment by July 12th. 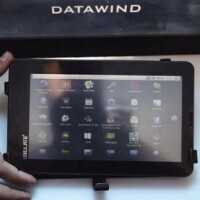 U.K. manufacturer Datawind had built the first two iterations of the tablet but the government says that it has not yet decided who would get the contract to produce the newest version of the slate. The original generation Aakash suffered from a poor resistive touchscreen. The second iteration of the tablet received better reviews thanks to the capacitive display onboard. The Indian government wants the Aakash IV tablet to have a 7 inch display, tip the scales at no more than 500g and be no thicker than three-quarters of an inch. The device should flaunt no less than 1GB of DDR3 SDRAM, along with at least 4GB of native storage. A microSD slot should accept 32GB cards and the battery should allow for at least 5 hours of web browsing and 3 hours of video playbook in 720p resolution. And while the slate should accept the latest "stable" version of Android, it should also be dual bootable and load the latest version of Ubuntu loaded through a microSD card. The browser needs to support HTML5. According to the requirements, the tablet's default language must be English although it also must support certain Indian languages such as Hindi, Tamil and Punjabi. Even though it will be priced super low at 1130 RS ($24.65 US), some say that the tablet is not worth the money. ohh the govt is now developing aakash 4.....has anybody seen and used the aakash 1,2,3? Yeah u r right...never seen any aakash tab here in my city or any other colleges. Kapil Sibbal took all the money ... how will you get to see the TAB? Never seen an Aakash tab yet. I always wonder where do they go? Money goes to Kapil Sibbal's bank account somewhere out of India. It is meant for students...for them to use as a medium to study and find interesting facts. But no one actually does that...they'll probably load movies, songs, games, pictures and nothing else. OMG only Rs. 1130/-, that's truly insane price for the specs mentioned. I have seen some Aakash tabs here in Mumbai, they are best at their rates and performs well.